FinCo has created many custom fiberglass parts for the Wiggins Lift Company, a major manufacturer of specialized industrial forklifts. 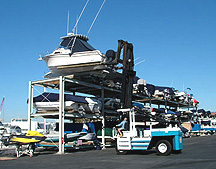 The company produces a line of Wiggins Marina Bull forklifts that are used to lift boats in and out of the water at marinas around the world. 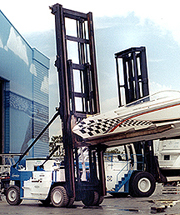 When working in a corrosive salt water marina environment, however, the prototype Marina Bull forklifts often suffered from substantial rust and corrosion to their metal components, especially the sheet metal body. 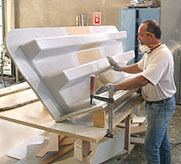 FinCo solved this problem by creating customized fiberglass forklift bodies, control panels, and other items to replace the metal components. FinCo’s craftsmen used the original metal parts to develop their master patterns and molds, then created a new line of fiberglass components that were immune to salt water corrosion and other environmental hazards. These highly durable fiberglass components are now standard features of all Wiggins Marina Bull forklifts.